In the final part of a recent sermon series, Stanley explained that while he believes that the Old Testament is "divinely inspired," it should not be "the go-to source regarding any behavior in the church." Stanley argued that it had to be done for the same reason the church in Acts 15 did so, which was so that "we must not make it difficult for those Gentiles who are turning to God." For Stanley, the difficulty lay with the Old Testament and his concern that many Christians are turning away from the faith because of certain passages in the Hebrew Bible. Stanley argued that the early church showed that there was a need to move past the Old Testament for the sake of gentile believers and that the resurrection of Jesus was enough. "Jesus' new covenant, His covenant with the nations, His covenant with you, His covenant with us, can stand on its own two nail-scarred resurrection feet. It does not need propping up by the Jewish scriptures," noted Stanley. "The Bible did not create Christianity. The resurrection of Jesus created and launched Christianity. Your whole house of Old Testament cards can come tumbling down. The question is did Jesus rise from the dead? And the eyewitnesses said he did." Stanley acknowledged that his comments may be considered "a little disturbing" to some, but then added that for many it is "liberating." "It's liberating for men and women who are drawn to the simple message that God loves you so much He sent His Son to pave the way to a relationship with you," Stanley said. "It's liberating for people who need and understand grace, who need and understand forgiveness. And it's liberating for people who find it virtually impossible to embrace the dynamic, the worldview, and the values system depicted in the story of Ancient Israel." While noting that he believed the church needed to unhitch itself from the Old Testament, Stanley still regarded the Jewish scriptures as having importance, saying they were "a means to an extraordinary end." "The Jewish scriptures are the backstory for the main story," Stanley explained. "They're an important backstory. They're divinely inspired. They are God on the move through ancient, ancient times." "It's the fabulous story of God the Founder playing by the rules of the kingdoms of this world, to establish a kingdom not of this world. To send a king who would be like no other king. A king who lay down His life for His subjects. A king who would introduce the entire world to God the Father." Stanley's sermon was the third part of a series titled "Aftermath," in which the pastor was trying to appeal to individuals who left Christianity over what they were taught the Bible said about certain things. "If you were raised on a version of Christianity that relied on the Bible as the foundation of faith, a version that was eventually dismantled by academia or the realities of life, maybe it's time for you to change your mind about Jesus," stated North Point Community Church. "Maybe it's time for you to consider the version of Christianity that relies on the event of the resurrection of Jesus as its foundation. If you gave up your faith because of something about or in the Bible, maybe you gave up unnecessarily." 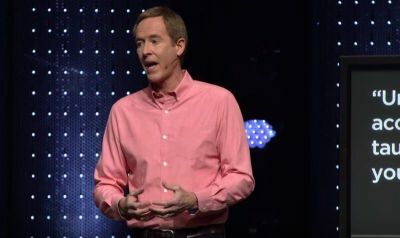 Days before giving the third Aftermath sermon, Stanley preached at the Orange Conference held in Atlanta, Georgia, using Acts 15, as well as John 17, to argue that church unity was more important than "theological correctness." "[Jesus] prayed for our oneness, that we'd be on the same page," said Stanley at the conference last month. "This is mission critical. If they are not one, we will not win ... unity is mission critical and disunity disrupts the mission."